"Gratitude is an important and holy trait," Rabbi Weiss, who is also spokesman of the nascent Sanhedrin, told Breaking Israel News. "He did a great and historical deed that the Jewish People are grateful for." An inscription commemorating Lord Arthur Balfour, the British Foreign Secretary who issued what was dubbed the "Balfour Declaration" that called for establishing a Jewish homeland in what was then the British Mandate of Palestine, will also appear on the face of the coin. The reverse side of the coin will be engraved with an image of the Temple. Rabbi Weiss stressed that Trump's goals will come to fruition only if they are geared towards rebuilding the Jewish Temple. "Cyrus and Balfour, non-Jews who played an enormously important role in Jewish history fell short and their political success suffered as a result," Rabbi Weiss said. 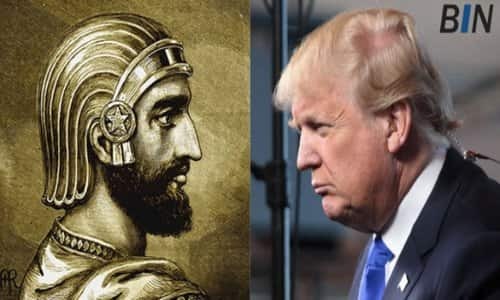 "Trump's political agenda can only succeed if it is focused on building the Third Temple on the place that God chose: the Temple Mount. He must not advance any two-state solution or this will lead to his downfall." Rabbi Weiss noted that Cyrus eventually gave attention to factions in his empire that opposed the Jewish people, and his dynasty suffered. Likewise, Rabbi Weiss also pointed out that Lord Balfour's political career, one of the longest in British history, ended in failure with him resigning from the government. Balfour had partially reneged on the Balfour Declaration at the San Remo conference in 1920 when the area in the Palestine mandate that was east of the Jordan river was taken away from land to be designated for a Jewish national home. "President Trump cannot allow the Arabs to believe that half of Jerusalem, let alone the Temple Mount, will fall to them,' Rabbi Weiss said. "This coin should serve as a sign of our gratitude as well as a reminder of what still needs to be done. 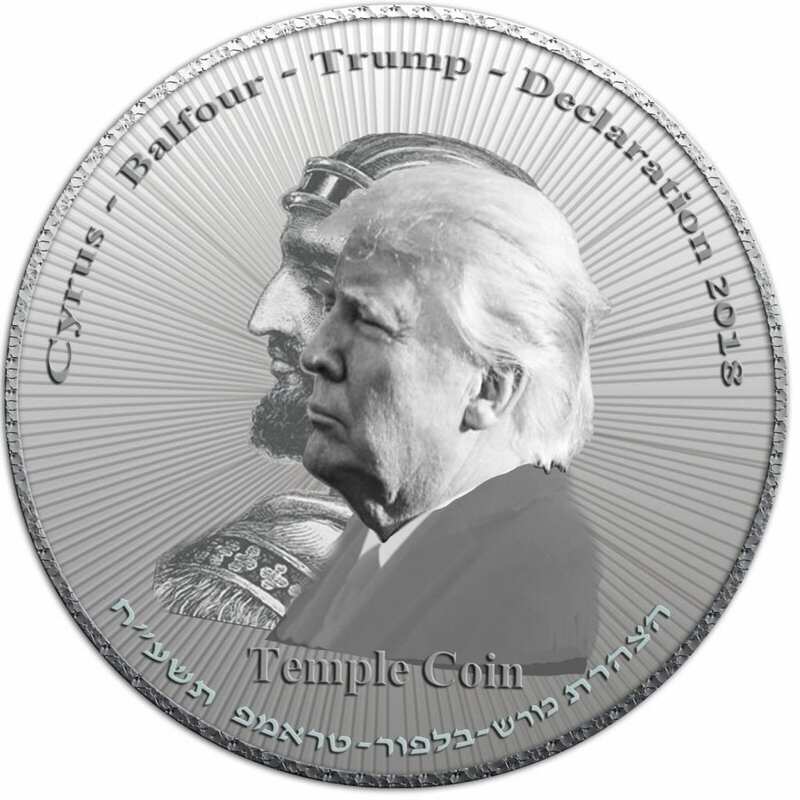 Anyone who owns this coin is showing that he agrees with both of these aspects: the gratitude for what Trump has done and the cautionary reminder that Jerusalem is the place of the Jewish Temple." Mordechai Persoff who established the Mikdash Educational Center which educates Jews about the Temple through formal and experiential education, said that the Trump's image is appropriate in light of his powerful example as a non-Jew who has assumed a role in the geula (redemption) and the building of the Temple. "God gave us the land as part of the covenant but non-Jews have always played an important role in waking us up to return to Israel," Persoff told Breaking Israel News. "This can come in two manners," he continued. "It can be a harsh reminder, as happened in Egypt with Pharaoh or in the Holocaust when the non-Jews reminded us that we needed to return to our homeland as a refuge. It can also come in a positive and loving manner, as it did with King Cyrus and Lord Balfour." "This coin shows that President Trump is a positive part of the Temple process, reminding us of what the Jews need to do." "The mitzvah (Biblical commandment) is for Jewish men of specific ages to sanctify the coin to the Temple. Until the Temple is built, it is not possible to sanctify anything to the Temple," Rabbi Weiss explained. "This coin is intended to help in preparations for the Temple and anyone can take part in that at any time." Should the need arise, the proceeds will be used for the actual building of the Temple. 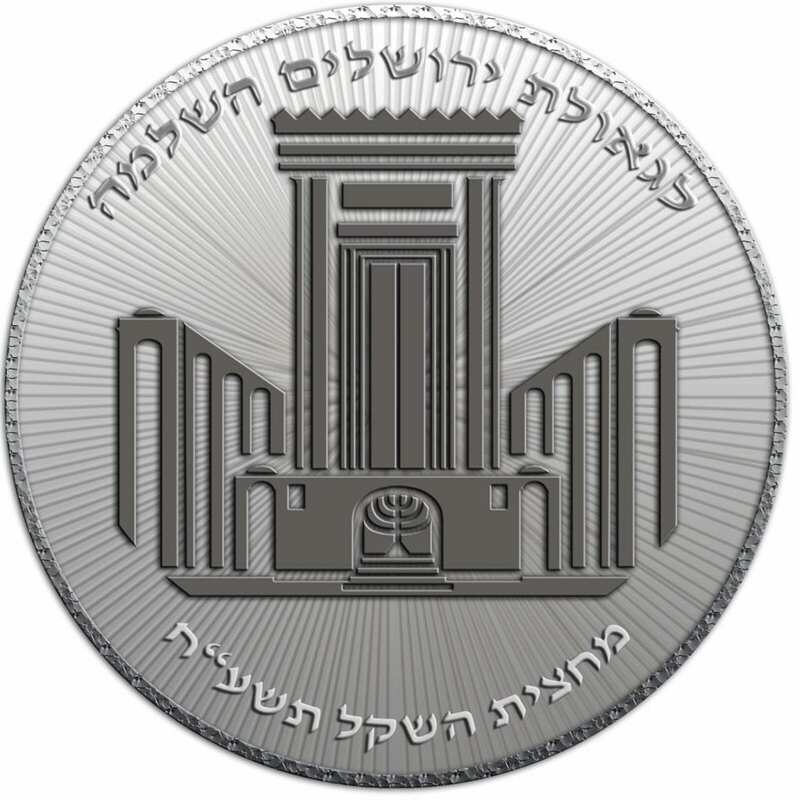 The coin can be pre-ordered at the Mikdash Educational Center website. Originally published by Breaking Israel News - reposted with permission.